Product prices and availability are accurate as of 2019-04-18 11:50:05 EDT and are subject to change. Any price and availability information displayed on http://www.amazon.com/ at the time of purchase will apply to the purchase of this product. 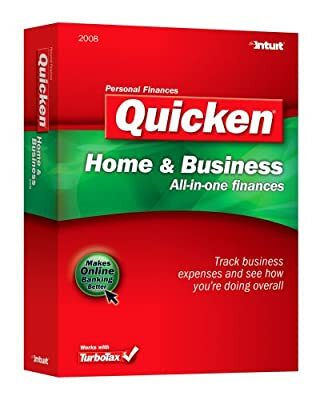 QUICKEN 2008 HOME & BUSINESS RETAIL WIN CD. $20 Any User Mail-In Rebate Sticker on outside of box at Launch;$30 Turbo Tax/Quicken Rebate 11/23/07 - 4/15/08. Small box. If you have a home business or are self-employed, you need Quicken Home & Business 2008. It is the only Quicken software that brings your personal and business finances together--while letting you manage them both separately--for a complete view of your financial picture. Easily see your total financial picture -- including your business and personal finances. Quicken helps you identify transactions you enter as business or personal, income or expenses, with a single click. See a monthly calendar of your paychecks, bills and expenses. Scan in and attach related documents to particular accounts or projects, so you have everything you need in one place for easy reference at tax time. Quicken Home & Business 2008 gives you the personal financial features found in Quicken Premier plus smart business tracking tools. Easily see your total financial picture--including your business and personal finances. You can manage them together or separately--and view them as you wish. Because Quicken Home & Business tracks both your personal and business finances, it's easy to track business expenses you paid for with a personal account--i.e., office supplies on a personal credit card or dinner out with a client you paid for with personal cash. The redesigned Business Center gives you an overall snapshot of your business and personal finances--what's coming in for the month, what's going out, and what's left over in your personal and business accounts. A new Profit and Loss view helps you see how your business is doing overall for the year. Quicken helps you identify transactions you enter as business or personal, income or expenses, with a single click. Avoid having to enter the same data twice. Quicken remembers the first time you enter a business transaction, then applies the same information to similar entries in the future. Bring your personal and business accounts--banks, 401(k) or other IRA, online brokerages--together in one place. Avoid the hassle of going to multiple web sites and trying to remember multiple passwords. (1) With Quicken you can you can see it all in one place with just ONE password. Just scan in and attach related documents to particular accounts or projects, so you have everything you need in one place for easy reference at tax time. If you need help purchasing, installing or upgrading your new software, free phone support is available for Quicken Home & Business 2008 through December 31, 2008. Clearly see your business tax deduction summary to date in the Business Center--and see other possible deductions that Quicken has found to help make the most of your tax return. The new Profit and Loss view in the Business Center lets you check in anytime to see how your business is growing. The Cash Flow Center gives you an overall snapshot your business and personal finances--what's coming in for the month, what's going out, and what's left over in your business and personal accounts. A simple drop down menu makes it faster to categorize your income and expenses as business and personal--right from your register. You can also add extra important details to any transaction, so you can assign it to a particular business, client or project. Whether it's personal payments or business income--or both--Quicken can now import your transaction data directly from PayPal. A new "My Savings Plan" instantly shows a summary of your actual spending and compares it to what you planned to spend for the month. Quickly see where you have room to spend or save more. Set flexible spending targets on regular expenses like gas and groceries and then check your progress as you go through the month. A more intuitive navigation makes it easier and faster to get around and discover the features and tools that work best for you. Tabs let you quickly switch between Quicken's main pages. And a new interactive account bar makes it clear which of your accounts you are working with at any given moment. If you're using Windows Vista, our new Quicken Billminder Gadget can remind you of scheduled bills and transactions directly from your desktop. (1) Online features require Internet access and are subject to change. Services vary among participating financial institutions or other parties and may be subject to application approval, additional terms, conditions and fees. More than 5,322 participating financial institutions as of 6/05/07. (3) To pay bills in Quicken requires Quicken Bill Pay (sold separately) or a third party bill pay service (fees may apply). (4) Email, Forums and Chat technical support provided 24 hours a day, 365 days a year. Phone technical support provided Monday - Friday, 5:00 am - 5:00 pm PDT. Additional fees may apply.